Reduces fresh water usage by up to 80%. HEAT and Control has released Gentle Wash, a potato slice washer that cuts fresh water usage by up to 80%. It also reduces downtime for fryer decrumbing by efficiently removing surface starch and fines from potato slices and wash water using a three-stage washing system. The system evenly meters potatoes through the slicers to reduce scrap generation. Starch and fines are initially separated as the slices are flumed into the Spiral Action Gentle Washer, which further enhances separation for more thorough washing. No mechanical agitation is used, greatly reducing slice damage that can produce cracked and broken potato chips. The slices are then flumed and spread across a de-watering conveyor and subjected to two reused water rinses and one fresh water rinse before passing through the AirSweep vacuum/blow-off dewatering system. This removes a maximum amount of surface water and fines from the slices and conveyor belt, reducing the heat load on the fryer. This in turn reduces fryer fuel usage and provides longer periods of fryer operation without de-crumbing. 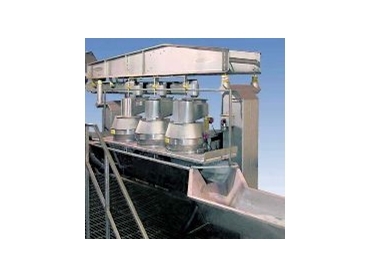 Gentle Wash cleans and reuses water by circulating it through a system of hydro-sieves for separating fines, and liquid cyclones for concentrating starch. Its low operating water volume assures fast water turnover so slices are continually exposed to clean water.